MicroAd Singapore Pte.Ltd., a leading online ad platform company in APAC, announces that ‘MicroAd BLADE’ is connected with ‘OpenX Market Southeast Asia’ in order to expand online display ads through RTB (Real-Time Bidding) for South East Asia (hereinafter referred to as ‘SEA’) regions and India. OpenX Market Southeast Asia is operated by Cyber Communications Inc. (hereinafter referred to as ‘CCI’). CCI operates ‘OpenX Market Japan’, which is one of the largest Ad Exchange in Japan. 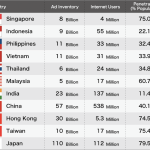 OpenX Market Southeast Asia is part of CCI’s new global approach to online advertising marketplaces for SEA. MicroAd provides MicroAd BLADE, a Demand-Side-Platform for online advertising by its own developed product, which enables clients to optimize algorithm of advertising. As part of the newly expanded exchange, MicroAd BLADE purchases the inventory from OpenX Market through RTB. MicroAd BLADE is known as the largest DSP in Japan and have a simple interface for display and smartphone advertising management. MicroAd BLADE contains a variety of language and foreign currency transactions since October 2012. MicroAd BLADE now is available in APAC regions and India. OpenX is a global leader in digital and mobile advertising technology. OpenX’s vision is to unleash the full economic potential of digital media companies. OpenX solutions provide a unique Software as a Service platform by combining ad serving, an ad exchange, which includes Supply Side Platform technology, and content valuation. OpenX Technologies, Inc. is based in Los Angeles and is backed by leading investors including Accel Partners, Index Ventures and SAP Ventures. For more information, please visit www.openx.com. OpenX and LiftDNA by OpenX are trademarks of OpenX Limited. CCI is a total interactive marketing company having its headquarters in Japan and now expanding into other Asian market with a branch in Singapore. CCI serves more than 500 advertising agencies and more than 500 publishers in Japan. MicroAd Ad-Network is one of the largest display and smartphone Ad-Networks in Japan, and serves over 70 billion of Ad-Impressions each month. Our Ad-Network reaches over 87% of audience users in Japan. In June 2011, we launched MicroAd BLADE, a Japanese DSP with RTB and have integrated with major exchanges and SSP. Till now, MicroAd BLADE has more than 5,000 Advertisers in Japan. With a global strategy for APAC regions, MicroAd has been open several offices in some countries such as China, Taiwan, Hongkong, Indonesia, Singapore, Vietnam and India.